To celebrate getting over 1/4 million downloads of my live wallpaper I decided to put extra effort into fixing problems some of my users were having. A common gripe with live wallpapers is the amount of battery they use and the associated performance hit when navigating on the home screen. I used to use java drawables to create and manipulate all of the particles on the screen, but I have successfully moved over to OpenGL-ES. This has an impressive benefit in performance (back of the envelope calculation shows >13x performance increase) and also improves the overall sexyness as OpenGL handles the blending nicely. Anyway enough of the boring stuff, let’s see what’s new. 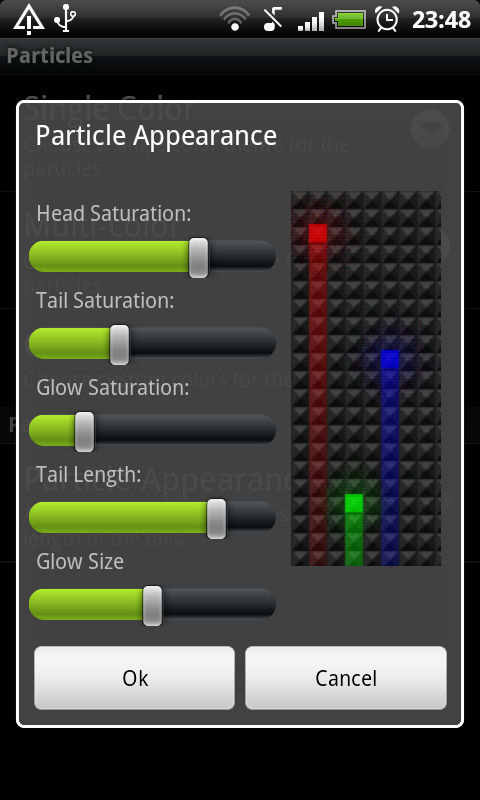 Something I’m REALLY excited about (hence the caps) is multi-touch! 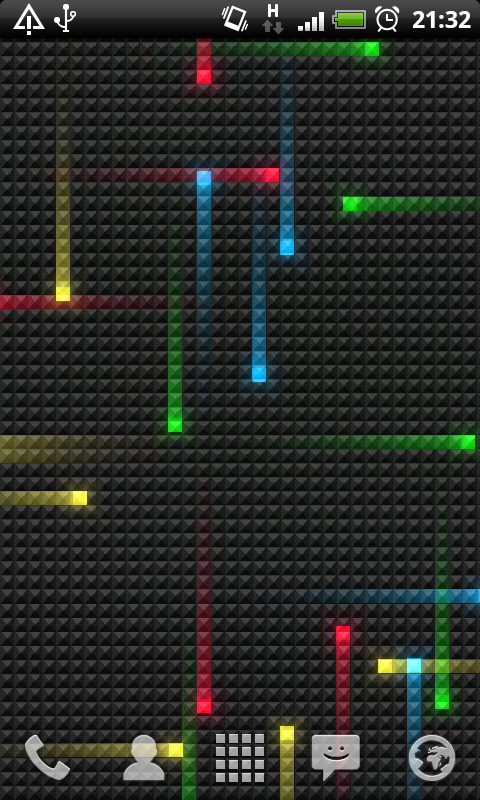 It is so much fun just playing with a blank home screen creating particles! Unfortunatly this isn’t something which translates well into a screenshot, so you’ll just have to try it out for yourself. I’d like to thank all of my beta testers for the very helpful feedback I have got over the past couple of weeks. There is much more to mention but I am now absolutely knackered. I’m sure I’ll follow this post up soon with some more interesting things. Enjoy! Here is a quick tip for better organisation of your program by grouping all onClickListeners into a simple switch statement. If you have lots of buttons or view that you are linking to OnClickListener events you can quickly end up with some cumbersome code. This can be changed very simply by implementing a method in your activity and switching between View ID’s. Below is an example the typical method for creating an OnClickListener for a View. If your write this in eclipse you can hover over the error this produces and click Add unimplemented methods to automatically create a stub for the next part. We now create our buttons similar to before, but for the setOnClickListener we pass this as an argument, so that our implemented method is called. We now create the implemented method for our activity (onClick) and we use a switch statement to find which View fired the onclick event and preform an action accordingly. 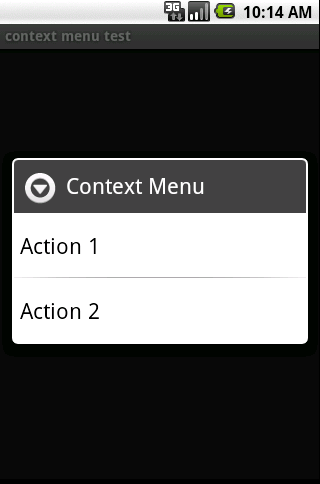 We then use registerForContextMenu in the onCreate of the activity to tell android that we want this view to create a menu when it is long pressed. This is not limited to buttons, this will work for other views too. 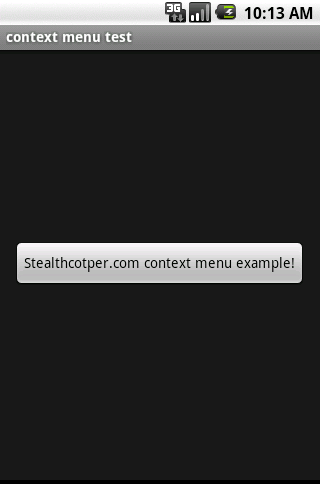 You must register each view that you want to have associated with the context menu. function1 and function2 are just place-holders at the moment that toast a message when they are used. In the above example we are choosing between Action 1 and Action 2 which define which function will be run when an item is selected. We have passed the ID of the view through the context menu and into this function so we can tell what the user was pressing when the context menu was created. When releasing an android application it is often desirable to release your application to the largest amount of users as possible. By developing an application with android 1.5 as the target, later versions are automatically supported (1.6, 2.0, and 2.1). However different screen-sizes were introduced with android 1.6 so by default an application will not support smaller screens (larger screens are automatically supported). Devices with small screens include the following phones T-Mobile G1, Samsung I7500, and the HTC Tattoo. 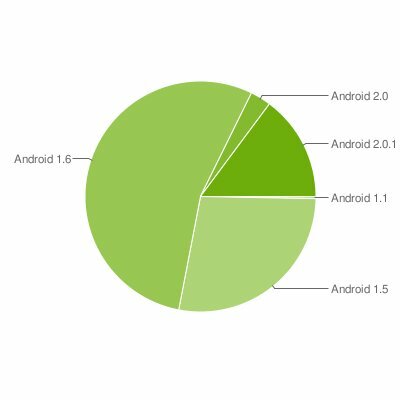 Unfortunately I cannot find any statistics regarding the percentage of small screen android users (if you can please let me know). However as the fix is very simple it seems stupid not to. Which version of android are you using? However in order to use the supports-screens tag the target of your application must be android 1.6 (or Sdk version 4). We can allow our program which is now targetted for android 1.6 still be avaliable for android 1.5 (Sdk version 3) by adding android:minSdkVersion=”3″ to our uses-sdk tag. Now your application can be built for 1.6 supporting smaller screen sizes and still work on 1.5. Unfortunately eclipse currently does not acknowledge minSdkVersion and will not give you the option to test your application in any android virtual devices (AVD’s), while this is not fixed you can manually install the package into your AVD. For this you need to know the name of your emulator instance, to do this first run the AVD and then use the followin command to find out the name. So we can see that the emulator instance I need is called emulator-5554. We can now use adb to install a package into this emulator. 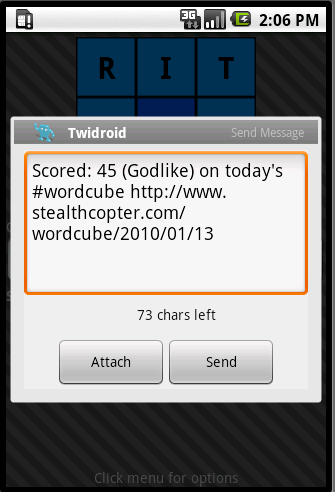 The below example shows installing wordcubefree from the bin folder in my project to my AVD using adb. In my android apps I was getting annoying problems that whilst playing sound the volume buttons would control the media volume, but when no sound was playing they would control the ringtone volume. I found the following by trial and error, hopefully this post will help people with the same problem. I imagine this is also possible via and XML settings, if anyone knows of this I’d be very grateful to know how! Quite a few people have been asking how to save a file to the SD card in order to register it as a ringtone. The following example creates a function that will save a resource to the SD card (ie: from R.raw.soundfile to /sdcard/media/audio/ringtones/soundfile.ogg) and register it as a ringtone. I have split this example into two parts, the first part goes through the code a section at a time with a brief explanation of what it does, the second half is just the code that you can copy and paste and then edit to your hearts content. We first setup our function to return a boolean depicting if we have failed or if we are successful. We accept in an integer which corresponds to the raw sound file. The following chunk of code creates an inputstream from the raw sound resource and loads it into a buffer. We add in the mandatory try/catch clause around these operations and return false if an exception is raised (to indicate failure to the rest of our program and to prevent trying to continue act upon this sound). Comments, suggestions etc. are always welcome. Hope this has been helpful. 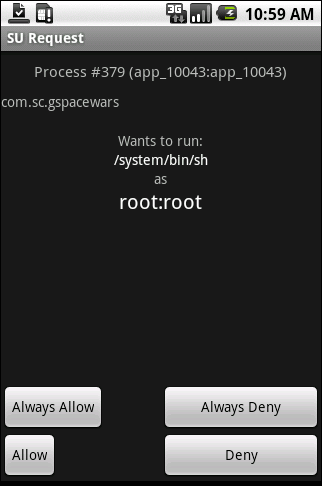 Opening up a website from an application in android is very simple thanks to “Intents”. An Intent is a request to android use an application to preform a task. The code below shows a very simple example of launching a browser to go to the wordcube website. We have surrounded the activity with a try/catch which will be raised if android cannot find an application that will accept this intent, in this case a web-browser. It is highly unlikely that an android phone will not have a web-browser installed but it is a good practise to get into. Below are some code snippets for sending messages to twitter from your application by utilizing a twitter application. The following code will create a new intent(a request to android for something to happen) for the twidroid application and pass it the message we wish to send. It is important to set the type of the intent as it will fail without it (from at least android 1.5). It will then start the activity and we use a try/catch encase twidroid is not found. But what if someone has a different twitter application installed? this can be solved by offering the user a choice of application to open. 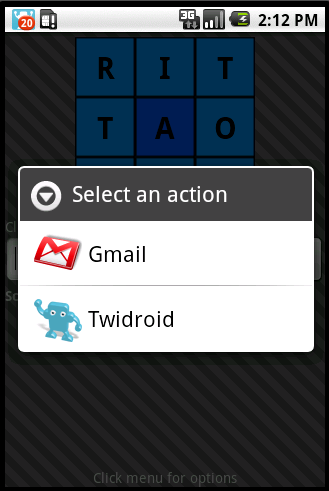 By combining these two solutions we can make the choice dialog only pop up if the system cannot find the twidroid application. This can be then taken even further by asking the user if they wish to visit the market place to install a twitter application if none is found. Where intentMarket() is defined a to open up the market and search for the specified application passed to it as a string. 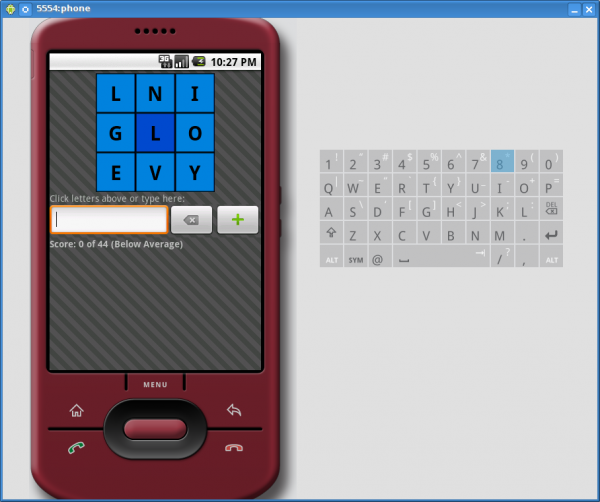 Below shows two screenshots from the wordcube application. This application is avaliable for android, see here for more information and download link (or visit market on your android device). Update: This is now taken into a complete function in this post.